I'm in the back seat of a jeep that is rocking from side-to-side as the driver navigates his way through a very narrow natural cutting between two imposing walls of rock. Ahead of me, through the dusty windscreen and beyond the wildly swinging good luck pendant that is hanging from the rear view mirror, I can see the other jeep in our convoy of two making its way through. I am getting a sneak preview of the next tight squeeze that awaits us. We're making our way as a group toward the launch site for a balloon ride. No, make that 'the balloon ride of a lifetime'. 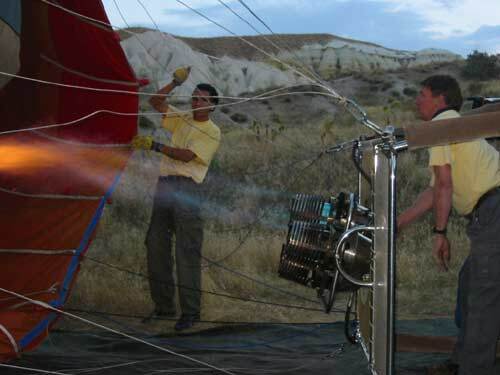 This is no exaggeration - none of us have done this before, none of us expect to do it again, and we've all said much the same thing in the days leading up to now: "If you're going to go ballooning anywhere, this is the place to do it." 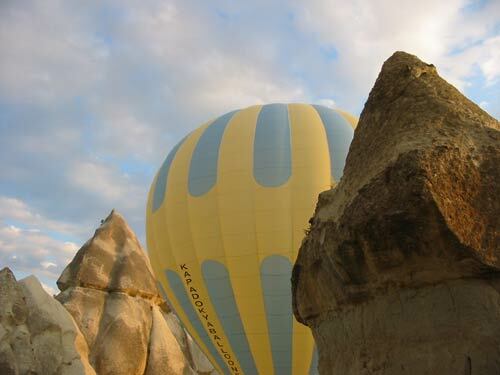 We're about to take to the skies over the beautiful location of Capadoccia in Central Turkey. It is a place that is often described in guidebooks as having a 'lunar landscape'. This feels like the wrong description to me as we continue to carve our way through the narrow gorge. Lunar suggests flat - this is anything but. It is, however, out of this world. 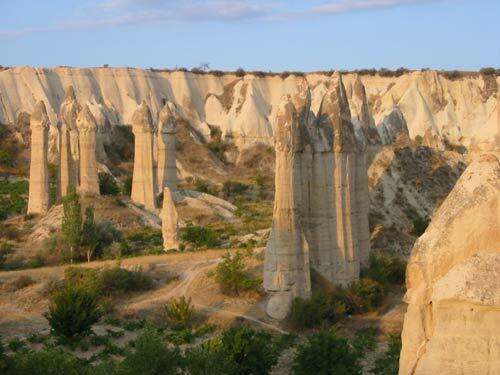 The features to be found in Capadoccia are truly unlike any other. Formed over millions of years as a result of numerous volcanic eruptions, the debris and ash has compressed, layer by layer and then been eroded by wind and water to form the most outstanding and unlikely shapes imaginable. 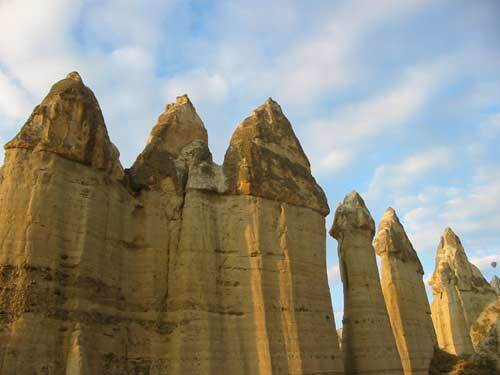 The soft 'tufa' rock has also been eroded by human means too, with many of the strange conical structures sporting windows and doors to cavernous interiors. For now, though, all we can see is a wall of rock outside the jeep's windows. We finally emerge from the gorge trail into a wide-open clearing where an early-bird support crew are already unpacking the ballooning gear. The sun is just rising over the nearby hills, casting an orange glow to the tufa rock. The skies are clear - the signs are promising, but it's still too early to discard our tightly zipped up fleece tops. Our balloonists for the day - or pilots as they prefer to be called - are a husband and wife team, Lars and Kaili. While Lars helps the ground support crew ready the balloons for take-off, Kaili goes through the safety routine that she has no doubt carried out hundreds - if not thousands - of times before. And each time with the same enthusiasm, the same well-timed jokes. All this while people are desperately trying to take photos of the balloons as they begin their transformation from giant ground-sheets to something resembling balloons. The ground crew begin filling the balloons with hot air. Most of us on the site are from one tour group, but there are also a few unfamiliar faces, including a honeymooning couple and a family of four - excited dad, indifferent mum, incredibly indifferent 11-year-old daughter, and screaming toddler. As we are divided into two groups I discover that I am to be joining the strangers along with a handful of others from my group. I don't mind being split up from the rest of the group, but I make a mental note that if we need to reduce ballast for any reason, the toddler's going over first. Looking up in to the clear blue sky, we can already see 5 or 6 other balloons in the distance. 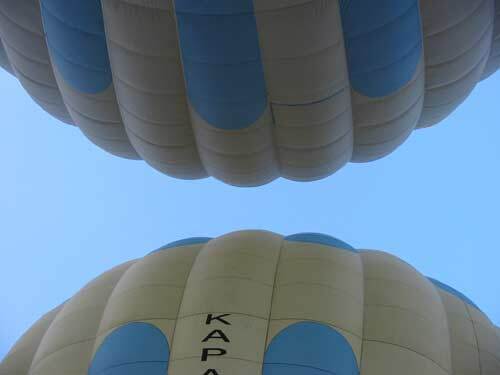 We may be slightly late starters, but this is for a good reason - our pilots have been able to assess the air currents by watching the other balloons, which should ensure that we get the most out of our journey. Looking up at the balloons, just prior to lift-off. With the various safety briefs out of the way, we climb into our respective baskets. Then something magical happens - the toddler stops screaming. So relieved am I by this, I almost don't notice that we have started to hover. It's very slight at first, then you can hear the long grass underneath just tickling the basket as we begin to glide sideways, but this noise quickly disappears as we gain a foot, two feet, ten feet and so on. All the while we're taking snaps of the other balloon whose occupants are similarly taking photos of us. We were told that the pilots were able to take us up and down through the valleys, and we soon find out just how skillfully they are able to so this. The balloons glide through the middle of the valley, and as I look over to my right I can see the shadow of our balloon cast upon one of the rock-cut houses and behind that, the other balloon of our pair slightly higher and just emerging from behind another rocky structure - it's as if we're playing hide-and-seek. 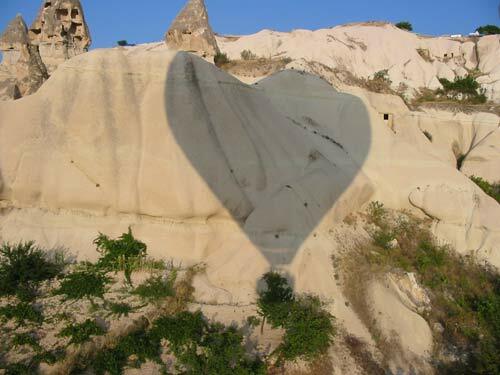 Our balloon casting a love-heart shaped shadow on the rocky hillside. "Does anyone want an apple?" says Lars? Without waiting for an answer, he instructs the honeymooning couple at the front (can a balloon have a 'front'?) to lean over and grab a handful from the tree that we are about crash into. Correction, we are about to 'give it a shave on top' - I should have more faith by now. As the basket drags over some of the lower branches, the couple manage to scoop half a dozen apples from the higher branches. Something tells me Lars has done this before. I only hope that the farmers who own the trees get some compensation for this display of piloting skills! It's an exciting feeling though - to be cutting a swathe through these rocky structures, picking fruit as we go - it's so easy to forget that there's an absolutely HUGE bag full of air directly above us that needs to be carefully steered around obstacles. Having taken an apple each to munch on, we find ourselves once more on the up - we're leaving Love Valley and are rising, rising, rising. 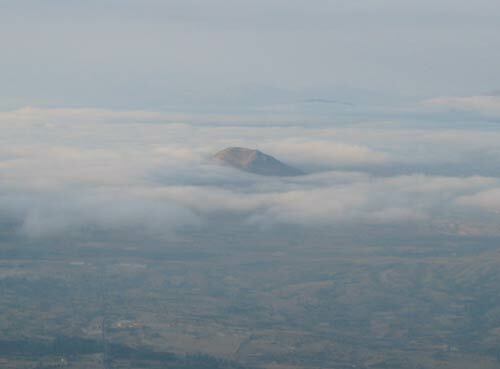 As I look down at the ever-receeding landscape it occurs to me that our balloon trip is over. I can't see any other similar valleys nearby and think that we're trying to find a suitable landing spot. Still we rise. I ask Lars how high we are - a look at the altimeter shows that we're 7,000 feet above sea level, which actually means we're about 4,000 above the ground. It's a fair way down! At around 2,000 feet another person in our balloon - a mad Kiwi named Brent - jettisoned a half-eaten apple into the empty farmers fields below and we tried to watch its descent. It seemed to take a long time. I wonder how long it would take to hit the ground from this height. Actually, the strangest thing is that all I can truly think about is how easy it would be to clamber over the edge of the basket and go for one hell of a wild ride, albeit a short and not-to-be-repeated one. Several thousand feet up over the Capadoccia landscape. Low-lying clouds surround a distant peak. Fairly soon we find ourselves so high that we're actually looking down over clouds in the distance that are wrapped around one of the peaks. I ask Lars what the plan is and he explains that the reason he has gone so high is to catch another thermal so that we can head off in an entirely different direction. I was wrong - we've still got plenty of ballooning to go! The thing about ballooning is that you cannot really know what to expect. We've been lucky with the weather - it's a beautiful day, and the thermals provide us with a good solid hour's worth of unique sight-seeing. Brent manages to run off 72 photos in that time, and I've been having to remove other less exciting (and probably repeatable) photos from my digital camera to make room for the views from the basket. The trip ends with a very gentle touchdown in a (thankfully) very flat field - the text book landing (and landings need careful planning here - if the pilots don't liaise closely with the ground support crew by radio, it's easy to land in an area inaccessible by road, and you might wait half a day for a 4 by 4 to come and collect you!). We all join in to help the support crew roll up the many square metres of balloon material (imagine trying to pack your entire wardrobe into your smallest suitcase and then sitting on top of it to force it in - that's a similar experience) before celebrating with a glass of champagne. One of the ground crew is speedily festooning the basket with garlands of flowers, all ready for the forthcoming group photos. 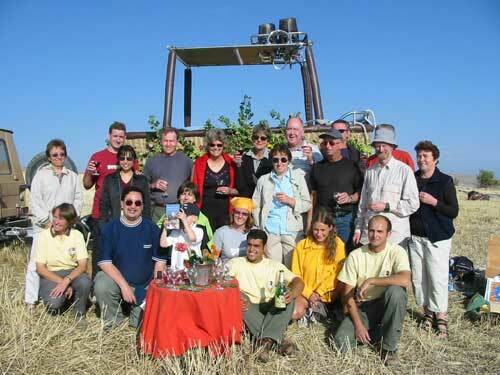 We all hand our cameras to another one of the ground crew, Ufuk, then gather in front of the basket. It's difficult to say what looks sillier - all of us with our shades and champagne, or Ufuk with 20 cameras hung around both arms, his neck and anywhere else that could sensibly be used. He must be well used to it by now, but for us this was almost certainly a once-in-a-lifetime experience - one that I'd encourage anyone to try given half the chance. Final group photo: (l-r, back row) Rachel, Ian, Manda, Ted, Barbara, Pat, Moira, Terry, Brent, Jeff, Colin (covering Tony) and Pat; (l-r front row) Kaili (pilot), Robert, Belinda, Louise, ground crew guy #1, Alena, ground crew guy #2. Only Eric missed out on the ballooning trip!